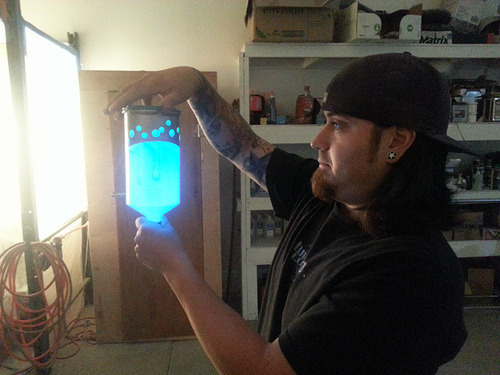 This new LumiLor™ Electroluminescent Coating System is pretty amazing. Complicated and expensive, but amazing. 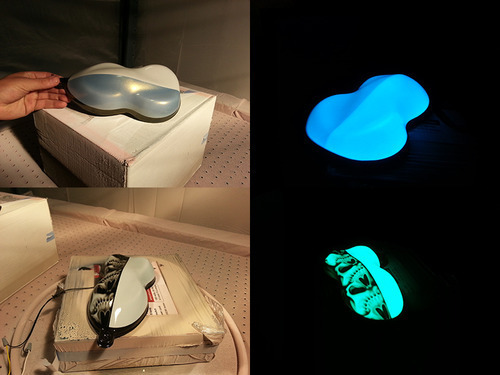 It is not glow in the dark, it’s an actual paint that lights up. 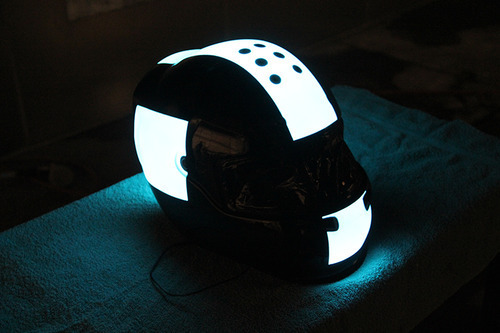 Can you imagine riding around with a glowing helmet? 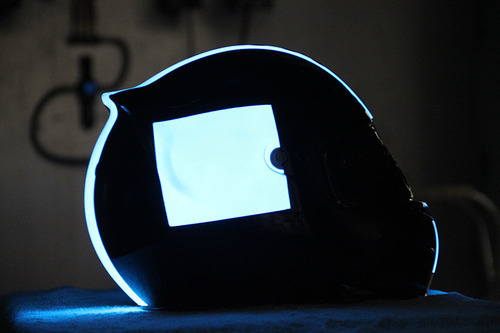 This carbon fiber helmet from Polen Designs featuring LumiLor is a good example of just how bright it is. “Electroluminescence (EL) is a characteristic of a material that enables it to emit light in response to an electrical field” their website explains. You can use the paint on almost any surface- metals (with primer for electric insulation), thermoplastic, wood, glass, granite, carbon fiber and more. It can be used over complex curves so it’s basically limitless and can be used all over motorcycles, inside cars, whatever. 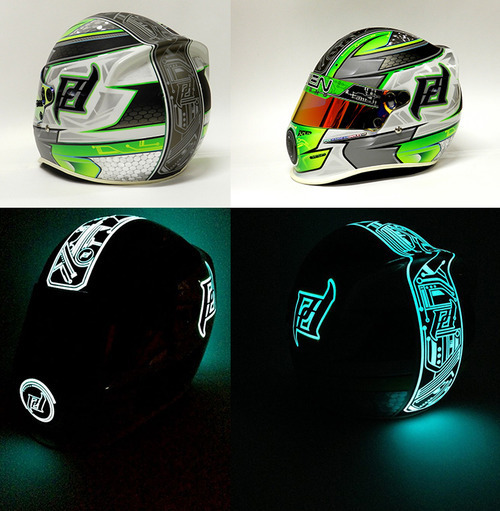 Here’s an on/off example of a motorcycle paint job with layers of LumiLor. 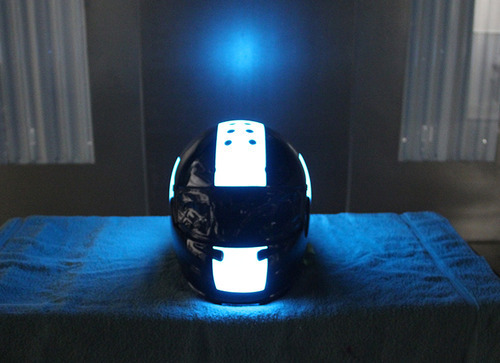 The electronic components are relatively simple, the paint lights up when charged with an electric current. Application requires a skilled painter, however it is sprayed with a standard HVLP paint gun. Shining through a lot of other paint coatings including black and even cosmichrome. The LumiLor paint comes in white, green, blue, blue-green, and orange. Using color subtraction, you can paint almost any color over the white LumiColor and achieve almost any color effect. Amaaaaazing. There seem to be a lot of skulls used in the examples so far, but the possibilities are literally endless. Tron-style-glow-bikes here we come. 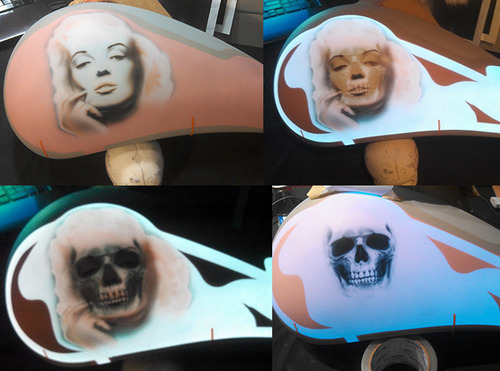 The Marilyn Monroe/Skull piece is pretty cool, I must admit. Here’s the basic overview video on what this stuff can do. There’s even a snazzy light up leopard print helmet and guitar! They illustrate some interesting ideas, such as illustrating a paint job. My nerd brain immediately thinks of a Tetris paint job. OMG. Visit the LumiLor website for more videos and examples of applications. I can’t write anymore, my brain is exploding with ideas. Oh, and screw solar panel roadways, let’s just paint all the lines with this stuff! Hat tip to Monstercraftsman for turning me on to this rad stuff with your LumiLor Illuminati training video (click to watch).